Connection of KNX lines with aid of data networks and use of the Internet protocol (IP). 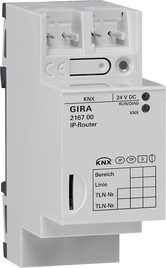 Coupling of a KNX system together with the Gira HomeServer or Gira FacilityServer. Filtering and forwarding of telegrams. Use as line or area coupler. Recording of KNX telegrams on a microSD card. Hardware from index status I14 prepared for KNX Secure (additional firmware update required). Up to four tunnelling connection possible simultaneously. Reliable communication for automatic correction of telegram losses in WLAN (Reliable Communication). Supply via external DC 24 V.
microSD card is not included in the scope of supply. Software update for KNX IP router from index 02.